This Certified ScrumMaster® (CSM) course is an intensive deep dive into creating and continuously improving your Agile capability using the world's most popular Agile method: Scrum. To be eligible for CSM, you must complete the full two-day course and all coursework, and pass the online CSM test, which you complete online following the course. The course provides an immersive learning experience emphasising hands-on participation through a mix of interactive seminars, group discussions, team activities, games and role-plays. We use highly immersive adult learning techniques such as visual modelling, simulations, role-plays and 'Training from the Back of the Room' activities to enable self-directed learning and enhanced retention. Unlike Scrum courses with other trainers, this course offers a Trial Scrum Exam on day 1 with answers discussed day 2. This provides you with clear feedback on your Scrum knowledge in preparation for the post-course certification test. Completing the CSM is your first step towards achieving Advanced Certified ScrumMasterTM (A-CSMTM) and then Certified Scrum Professional® – ScrumMaster (CSP®-SM). The course is suitable for all participants in Scrum projects including analysts, programmers, testers, architects, project managers and business representatives. 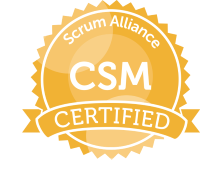 All CSM courses are taught by Trainers approved by the Scrum Alliance. Taking a CSM course, passing the CSM test, and accepting the license agreement designates you as a Certified ScrumMaster, which indicates that you have been introduced to and understand the basic concepts you need to perform as a ScrumMaster or team member on a Scrum team. This course also provides pre-requisites required for the Advanced CSM and the CSP-SM (as outlined previously). The course fee covers two attempts to take the CSM test, the first two years of certification, and a two-year membership to the Scrum Alliance community where additional Scrum information is available. Attendees will be notified about this test by the Scrum Alliance. The official material for preparing for the test is available from The Scrum Alliance resources page. Test results will be communicated to each participant by the Scrum Alliance. Upon successful completion of the test, participants will be enrolled as Certified ScrumMasters. Equinox IT works with Certified Scrum Trainer Rowan Bunning to deliver Certified ScrumMaster and Advanced Certified ScrumMaster training. Post-course follow-up. Rowan, along with the team from Equinox IT, can provide post-training coaching and we've done so with a wide range of organisations in industries including banking, government, insurance, superannuation, services, retail, manufacturing, utilities and telecommunications.